Cabinets and drawers are made from strong 18 or 20swg sheet steel, for durability and frequent use. Supplied with hard wearing work surface with twin socket box, perfect for electric tool use. Louvre wall panel and bins are included, handy for storage of small parts. Base unit cupboards each have 2 adjustable shelves for flexible storage. 4 base units, 1 drawer unit, 2 cupboards & 1 broom cabinet. Tilt bin and tool panel HxW: 500x1000mm. Additional drill and plug kit included. 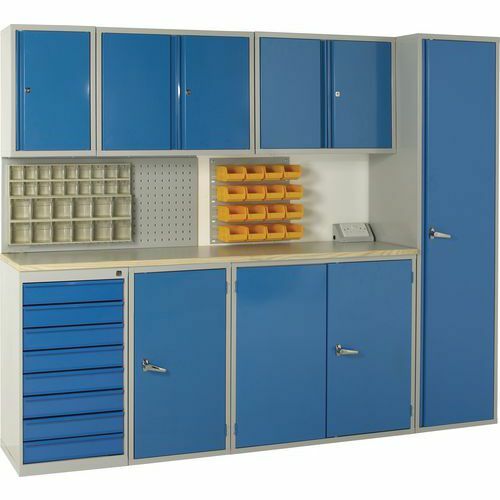 Complete workshop kit - the full workshop storage solution. Please note: All of these products are supplied as separate units.